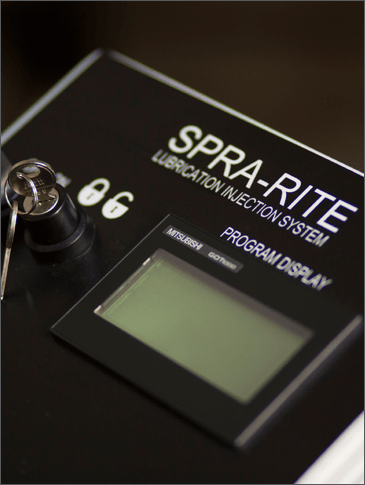 SPRA-RITE™ Controls utilize an interface to define, manage, and store the critical process variables associated with the control of the lubricant application process. The volume of lubricant and stroke count are loaded into each of the injectors independently using touch key controls. Existing programs are easily edited using the menu prompts and the touch keys. SPRA-RITE’s design provides our customers the unique ability to custom design a lubricating system to meet their specific process requirements. NOTE: For less complex applications, we offer our Alpha Processor with capability to control up to 6 injectors for volume and stroke.